The low cost failure and yield monitoring system for plants with a maximum power of 15 kWp. Includes alarm function and graphic evaluation on PC. The Solar-Log 300 can be installed in plants with a maximum total power of 15 kWp, regardless of the number of inverters. Therefore, this new model can monitor smaller plants with two or three inverters of the same manufacturers without any problems. 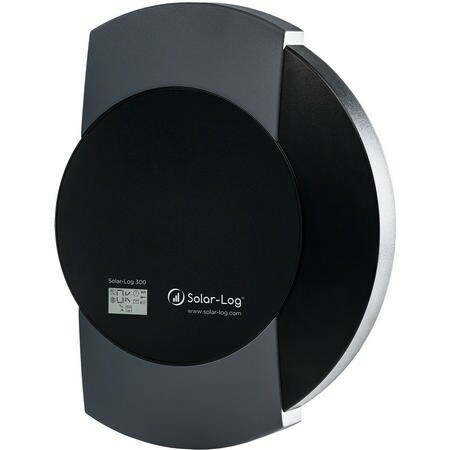 Solar-Log™ Easy Installation The inverter detection and the Internet logon start immediately. The installation status is shown on the LCD-Status-Display. The manual configuration of the Solar-Log™ can be performed via the WEB interface. Easy Installation is compatible with the Solar-Log™ WEB “Commercial Edition” and “Classic 2nd Edition”. Smart Energy Self-consumption can be measured and displayed as a graph with a energy meter. Smart Energy logics activate and deactive individual appliances depending on the amount available energy. Inverters A maximum of 100 inverters (just one manufacturer per bus), maximum plant size 15 kWp. Inverter interface Inverters can be connected via an RS485/422 interface or an Ethernet connection.